saurav-nav: MSDYN365BC - Install Visual Studio Code. In the last article, we installed dockers for windows. Most of us know that for coding in Business Central on cloud version we will require to use Visual Studio Code. We all know that is future, I will leave it to you if you plan to ignore it but that is a clear Roadmap for the product in future. Even Business Central on-prem will allow customizing using NAV Developer environment I think its time we change our mindset and start using Visual studio Code. In this article, we will discuss installation of Visual Studio code that we will use in future articles to customize business central. Visual Studio Code is a source code editor developed by Microsoft for Windows, Linux, and macOS. It includes support for debugging, embedded Git control, syntax highlighting, intelligent code completion, snippets, and code refactoring. Is Visual Studio Code is a replacement of C/AL? No, it's not the way we code in NAV from ages will remain as it isin VS code. I would even say that coding in VS Code will make life more simple with new features that are available. Yes, it will change the way we used to code. It will not allow us to modify any base objects in any way. You can only see the Metadata of standard object but you cannot modify it. It will be hard as everyone of us will have to unlearn old way of customizing NAV and will need to learn the new way of doing things which is using events and subscriptions? Event and subscriptions are available from NAV 2016 and have enhanced in last 3 version. We heard a lot about extensions. Do we need to worry about it? If you have used extension V1 which is in NAV 2016 you might have the bad experience with them. Forget all those experiences and see the new V2 Extension which is completely automated. If you haven't used extensions (as developers) you don't need to worry about it. Its all automated. If you want to focus/learn then spent your time and energy on Events and subscriptions. Download the installer from the website, based on your operating system. Double-click VSCodeSetup Installer to run the installer. 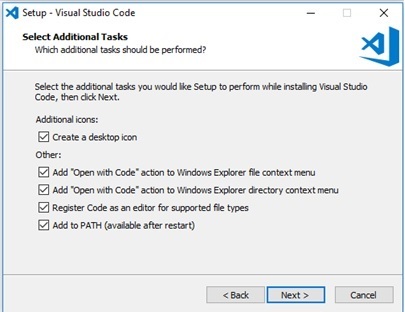 I would suggest - During Installation setup actions for windows (all) as shown below. Ready to Hack Business Central on Dockers. Just one more configuration that we will discuss in next article and then we will talk business. Questions? Please feel free to ask any question/suggestion/comment that you have.